Wear both shoulder straps. Don’t sling it over just one shoulder. Adjust the shoulder straps so they sit high on your back and are comfortable on your shoulders. If the backpack has a waist strap or chest strap, use it. The waist strap helps to distribute the weight load to the hips, relieving the pressure on the shoulders. A chest strap helps keep the shoulder straps in place and reduces swaying of the pack. Solution: Hold your clutch in one hand but remember to swap hands often. Focus on keeping your shoulders back and down, and your palms forward. This will “encourage” your shoulders to roll backwards instead of forwards. The latest fashion statement is to hook your bag on your elbow. This screams power and confidence. The problem with this pose is that is can cause the shoulders to round and as the bag is carried away from the body, it can put extra work on the elbow and biceps, especially if the bag is heavy. Remember what we are told about lifting heavy objects: Keep them close to the body and their weight is more evenly distributed and manageable. The best solution is to keep swapping arms and keep the load light. This style allows you to keep both hands free and, as the bag is held close to the body, the weight is more evenly distributed. This is the best way to carry your bag. It’s kind to your posture. Carrying your bag on one shoulder can be bad for your posture, especially if you carry a lot of things and your bag is heavy. This style can put pressure on the joints at the top of your shoulder (the acromioclavicular joint) causing local pain. It can also fatigue the muscles in your arm and upper back, as they work hard to balance the load. This can also affect the neck, leading to neck pain and even headaches. Solution: If you carry your bag in this way, use your free hand to support the weight of your bag. 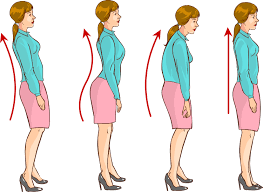 Focus attention on your posture, ensuring that your shoulders are back and down. If you are accustomed to carrying heavy loads in your hand, you will find that you end up leaning towards the load, causing asymmetry, and putting a stretch on one side of your body and compression on the other. As well as affecting muscles, this can irritate ligaments which can become inflamed and painful. But how you carry your bag doesn’t just affect your posture. It can have a negative impact on how you walk. Our natural pattern of walking involves swinging our arms. This is the body’s way of keeping balance. If you are unable to swing your arms and legs in a coordinated way, our body will compensate for this change in balance. So next time you pick up your bag, stop and think: Is your bag affecting your posture and walking style?